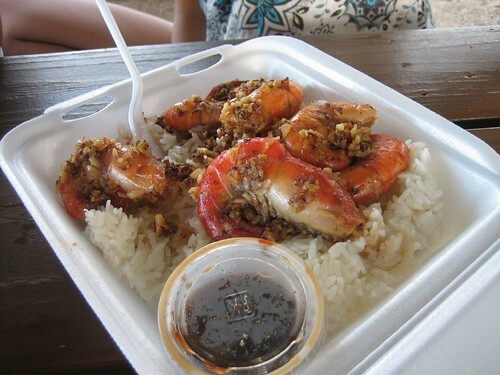 Taste test between the two major shrimp places on the North Shore. First, Romy's. The shack is located on the shrimp farm, so it doesn't get any fresher. The shrimp come in two sizes, shrimp which are about two inches when uncurled or prawns which are thicker and about three inches. The prawns are the thing to order. The simple steamed giant prawns which the server likened to mini lobsters, sell out quickly. We arrived at around 3:30 p.m. and the person in front of us ordered the last serving. Bad luck. The prawns cooked with the sauces are smaller, though still big in comparison to the prawns you see on mainland. Butter and Garlic is just that, the garlic was fried to a crisp and the prawns had that fresh snap when you bite into them. Excellent texture with a strong buttery flavor. The Spicy and Sweet is more sweet than spicy and has a slight stickiness to them. Also good, but somewhat masks the fresh prawns. 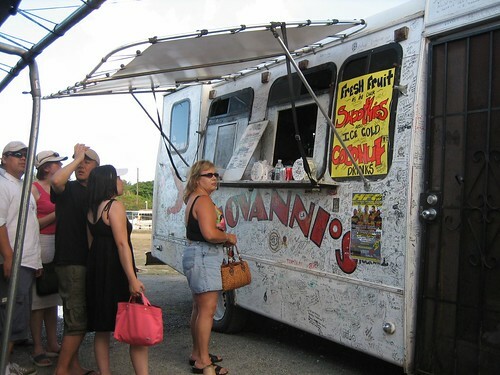 Next, I headed down the road to Giovanni's Shrimp Truck which is known for it's Shrimp Scampi. First thing I notice is that there is only one size of shrimp about an inch and half uncurled. 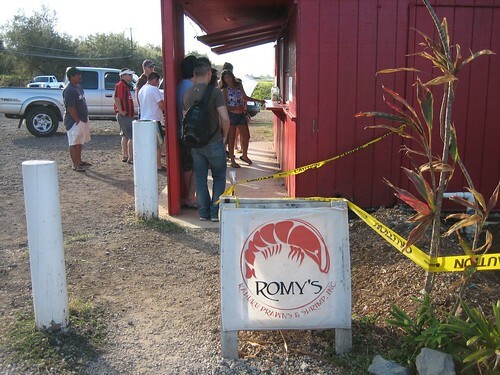 They don't have that fresh crisp bite of the prawns at Romy's. The preparation, however, is delicious. Scampi: butter, garlic, white wine and perhaps shallots. The garlic is soft and melts into a buttery paste. It dominates the sauce, though the white wine flavor still comes through. I would eat at both Romy's or Giovanni's again. If forced to choose, I'd go to Romy's. The prawns are unusually large and fresh when compared to what is offered on the mainland. 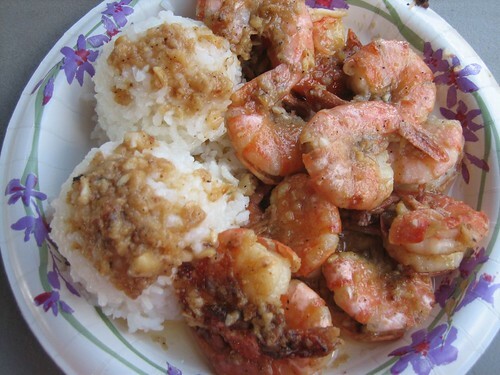 It's no surprise that the most popular dish is the very simple, steamed giant prawns. At Giovanni's the sauce is the star, it is more flavorful than the preparations at Romy's and compliments the shrimp very well. 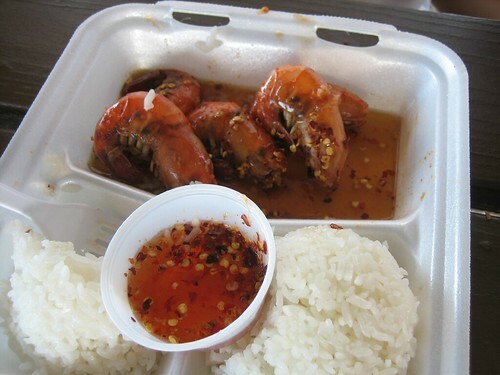 If I lived in the area and had access to large fresh prawns everyday, I'd probably frequent both places often. Thanks for the seemingly unbiased review. The prawns are what have me going back to Romy's.